For more than half a century, the events and personalities of San Diego—including those of the University of California, San Diego—were chronicled, analyzed and brought to life by journalists Judith Morgan and her late husband, Neil. Now, The Judith and Neil Morgan Endowed Fellowship at UC San Diego will carry forth their spirit of civic engagement, passion for writing and love of learning and discourse by supporting exceptional graduate students in the humanities and social sciences. 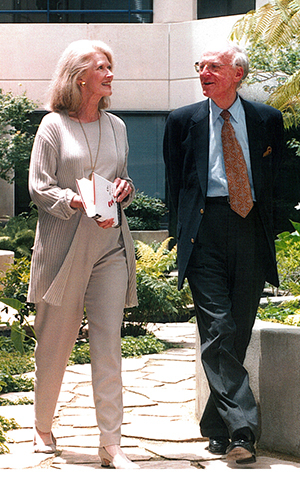 “Neil and I were always inspired by our friend Roger Revelle and the interdisciplinary vision he had for UC San Diego,” said Judith Morgan, referring to the renowned oceanographer who led the founding of the campus. The fellowship will support up to two doctoral students annually in the fields of humanities (literature, history and philosophy) and the humanistic social sciences (linguistics, sociology, communication and anthropology). The award may be used for archival or field research, dissertation-year support and general student support. As an endowment, the fund will provide resources in perpetuity to help UC San Diego recruit and retain top graduate students. A San Diego media icon, Neil Morgan was known as both a booster and critic of the region, as well as a skilled writer and civic leader. He worked for the San Diego Tribune from 1950 until 1992 in positions including columnist and editor. He continued writing at The San Diego Union-Tribune (the newspaper created from the merger of the San Diego Union and Tribune) and later for the nonprofit digital news organization Voice of San Diego, which he helped start. As a reporter for the San Diego Union, Judith Morgan covered the beginning and growth of UC San Diego. She wrote about the first class of undergraduates, who arrived in the fall of 1964, and interviewed early chancellors Herbert York, John Galbraith and William McGill, as well as Harold Urey, the Nobel Prize-winning scientist who helped found the chemistry department, and Andrew Wright, one of the founders of the literature department. Together, the Morgans wrote “Roger,” a biography of Roger Revelle published by Scripps Institution of Oceanography in 1996, as well as “Dr. Seuss & Mr. Geisel,” a biography of writer and illustrator Ted Geisel. In addition to writing about the campus, Judith served as a member of the first Board of Overseers (now the Chancellor’s Community Advisory Board) in 1973 and is an emeritus trustee of the UC San Diego Foundation. Neil was awarded UC San Diego’s first Chancellor’s Medal in 2000 in recognition of his unique contributions to San Diego. One of the priorities identified during UC San Diego’s recent strategic planning process, led by Chancellor Pradeep K. Khosla, was the need to grow the graduate student population in order to remain competitive with other top research universities. In addition to pursuing their own scholarly work, graduate students teach and mentor undergraduates as well as collaborate with faculty on research. Graduate students in the humanities and social sciences are engaged in scholarship that connects the past and present to society’s future progress. To attract top students, UC San Diego is raising funds to be able to offer more graduate student fellowships. A critical recruiting tool, fellowships enable the campus to compete with peer institutions, which are often able to offer higher financial packages for exceptional students. To learn more about graduate fellowships at UC San Diego, and to make a gift, visit the fellowships website.